From the beginning, printers needed to make preliminary or trial proofs for checking over the type and for proof-reading. 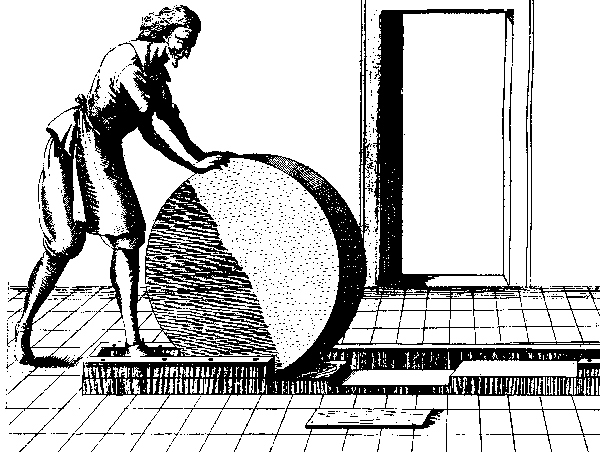 The earliest proofs were usually printed on the same kind of hand-press that was used for book production. And, in fact, iron hand-presses survived well into the 20th century as proofing presses. But from earliest times, a printer could also merely ink the type by hand, lay a piece of paper on top, and apply pressure with a hand-held roller. As early as the 17th century, printers tried to find a way to do this more efficiently—below is one idea that probably didn’t work out…. By the middle of the 19th century, as presses became bigger, steam-driven, and more complicated, and as more and more pages of type could fit in the press, it became even more necessary for type to be proofed quickly, easily, and precisely. Special proof presses, like the Challenge press below, were common from the mid 1800s until the mid 1900s. I used one called a Nolan that was even simpler than this one until the year 2000! Robert Vandercook took the proof press to a whole new level of precision and ease of use, from his first press made just before the First World War, until his last, in 1976. In those 67 years he produced 30,000 of these exquisite machines. When I started out as a letterpress printer in the late 60s, letterpress was still the dominant way to print, and printing was the second biggest industry in New York City. There were thousands of printers and typesetting companies. I own a copy of the New York Typesetters Association listing from 1971 that lists over a hundred typesetting companies. And that doesn’t count the ones that were not in the Association, nor the ones that were part of printing companies. Every one of these companies had one, two, three, or even ten Vandercooks. With one or two exceptions, these companies were using Linotype machines to cast the type. 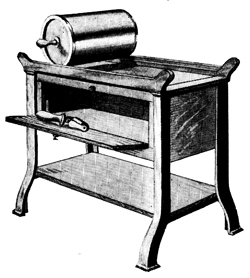 Vandercooks were used to proof the metal type that was then delivered to the printers. Around this time, things began to change. By the late 60s, offset printing was gradually replacing letterpress. Offset presses didn’t need metal type but only an image of type. Since metal type was the only way to create that image, a transitional technology developed. And the Vandercook was the key to making it work. First, the metal type was carefully proofed on a Vandercook, on special reproduction-proof paper made just for this process. Then these repros were cut up and pasted down squarely and cleanly on cardboard boards called mechanical boards. Every graphic designer in the 60s, the 70s, and even the 80s, needed to know how to use a drawing table, a T-square, and rubber cement to do these mechanical pasteups. The mechanical was then photographed, a negative film was made, and the film was exposed onto a light-sensitive, flat, printing plate. Of course, it soon became obvious that this was a convoluted process, and that metal type was not really needed. Numerous systems for setting type photographically, or photographically with primitive computers, were invented in the 70s but they were all put out of business by the 80s when the first Apple computers revolutionized typesetting and eventually the whole process of design, typesetting, and even printing itself. Figuring out how much type would fit on a page, creating the layouts, setting the type, and making up the page layouts now became one seamless process. By the end of the 80s, typesetting as a separate business was defunct, and the Vandercook press was no longer commercially necessary, or viable. Hundreds were sold or scrapped. Fortunately, the fine printing community had already discovered the Vandercook for printing fine letterpress books in limited editions. Clare Van Vliet and Walter Hamady were the pioneers in this, even before the presses were no longer commercially viable. Today there are hundreds of fine press printers using Vandercooks, many of which are at book arts centers or in teaching facilities at colleges and universities. I used mine commercially until just before September 11th, 2001—to print the monthly concert programs for the Frick Collection, but we also used it for some specialized purposes uniquely suited to the press. Take for example, The Works of John Chalkhill, a book we did for Charles Ryskamp, the former director of both the Morgan Library and the Frick Collection. Ryskamp is one of only forty members of the oldest, and most exclusive, book collectors’ club in the world, the Roxburghe Club. Each member is required to produce a distinguished book, marked by scholarship and by elegance of production. The printer of a Roxburghe book must include a list of members in each copy, and each member’s name must be printed in red on his own personal copy. Although we set the book itself on a Mac and printed it by offset, the list was set in metal type and was printed on my Vandercook in a tour-de-force of patience and craftsmanship. Eighty separate make-ready’s were needed to produce that one single sheet! Another use is for printmaking. The Vandercook is wonderfully suited as a printmaking tool and we used it that way as well. When Dean Bornstein worked for me in the 80s he used it to print editions of woodcuts, wood engravings, and linoleum cuts. The press itself was sometimes the subject of his art as can be seen in the tailpiece. A third unusual use of the Vandercook is to print monoprints. When Abe Brewster worked at the Oliphant Press in the 90s he used the press to create spectacular monoprints. Starting with a blank linoleum block, he carefully dropped paints on the surface in such a way that the pressure of the press created the image in unpredictable but beautiful ways. When the reality of New York City real estate forced me to move to smaller quarters, I gave my Vandercook to the Wells College Book Arts Center in upstate New York. We moved it out of a beautiful old loft building in the summer of 2007. It is now living out its old age in a bucolic setting, being used by a new generation of printers, discovering for themselves its beauty, its usefulness, its challenges, and hopefully, its history. © Ron Gordon, 2009. This essay was first presented as an illustrated lecture at the Center for Book Arts in New York and first appeared in print for the The Typophiles monograph The Joy of Vandercooking edited by Barbara Henry.